Sometimes, you just feel like drinking your favorite whiskey. Bringing a bottle of booze when you’re going out might seem a little bit too much. So how do you solve this dilemma without bringing a bottle of liquor with you? Well, it’s simple, just transfer it into a whiskey flask. Whiskey flasks are a neat way of storing and carrying your liquor. You can store them and bring them anywhere with you without any hustle. The liquid inside of the flask will stay safe while you can carry it anywhere you go. These flasks come in different shapes and sizes. There are a lot of flasks to choose from so don’t worry if you can’t find the one for you. If you’re a frequent traveler and you want to bring your favorite liquor along with you, place it inside a whiskey flask. There are a lot of reasons why you need to put your liquor in a flask. Some of those reasons include convenience. If you’re going on a vacation and you just need to bring that special liquor with you but you don’t want to bring the whole bottle, don’t worry. You can just store some of that liquor in a whiskey flask. Whiskey flasks can store an ample amount of your favorite liquor for you to bring with. These flasks are convenient to bring because of its small size and shape. The flask maintains the flavor of the liquor inside and keeps the whiskey fresh. This handy container could save you a lot of space when you want to bring a drink along. Just leave the bottle behind and pour some of that liquor in the flask and you’re good to go. Drinking on the go has never been this convenient. There are a lot of whiskey flasks in the market today. So make sure that you only buy the best flasks the market can offer. To give you a bit of information on what the best whiskey flasks are in the market, we searched for the 10 best whiskey flasks that you need to have. Bring out the Irish spirit in you with this amazing flask. The Whiskey Flask Celtic Dragon Stainless Steel by Mullingar Pewter has a great Celtic dragon design on its face. The flask is made from high-quality stainless steel metal and it can hold up 8 ounces of liquid. What makes this flask unique is that the dragon design is made from pewter. This metal could be easily shaped and altered to make the dragon design more detailed. You can buy this flask as a gift for a friend or for your own personal use. There are a lot of other designs that the manufacturer offers. If you’re not a fan of this design, there are a lot more for you to choose from. Be the first among your friends to carry an amazing flask with you. If you’re looking for a classy flask that has a different feel to it then the 8oz Stainless Steel Primo 18 by Primo Liquor Flasks might be what you’re looking for. This amazing flask has a leather coating wrapped around its body. The interior of the flask is made from quality stainless steel metal. The selling point of this product is that it has a genuine leather coating that creates a classy finish to the flask. The body itself is 50% thicker than most flasks which means that a leak will most likely not occur. The cap is made from copper which makes it a great finish for this product. Game of Thrones fans rejoice! If you love drinking while watching your favorite Game of Thrones episodes then the BLACK That’s What I Do Flask by Hip Flask Plus might be what you’re looking for. This novelty flask is perfect for those loving fans of the franchise. With its elegant black design and laser engraved quote, this flask will surely catch the attention of those who love the show. What makes this product unique is that the engraved quote will not easily disappear. It also holds the liquor in pretty well for a novelty item. Sometimes size does really matter and when it comes to flasks some people prefer it jumbo sized. If you’re one those who prefer it big then the Jumbo Stainless Steel Flask by Maxam is just for you. This bad boy can fit in as much as 64 oz, that’s plenty enough to get you through the day. What separates this flask from other containers is because of its size. Most flasks that are being sold in the market has limited capacity as compared to this flask. The quality of the product is also good, considering that it’s made from high-quality stainless steel. If you’re looking for a patriotic flask that screams out freedom then the American Flag Flask Black 9 oz by Menghao is what you need. This amazing flask has an American flag engraved in its leather coat. The flag will surely not fade because of the leather coat. The flask comes with 4 shot glasses that are covered with a leather coat and with an American flag engraved in the leather. What makes this item unique is that it’s easy to grip because of the leather design and that it’s leak-proof. It also comes with a funnel that makes transferring liquor easy. Ladies, are you tired of the same old flask designs? Here’s something that might pique your interest. The Bachelorette Party 5 oz. Stainless Steel Flasks by Thirsty Rhino is one for the ladies out there that love to drink on the go. Its girlish design and a funny quote will surely captivate you in buying this flask. This trendy flask has a variety of quotes for you to choose from. The selling point of this product is that it’s Vinyl Wrapped. 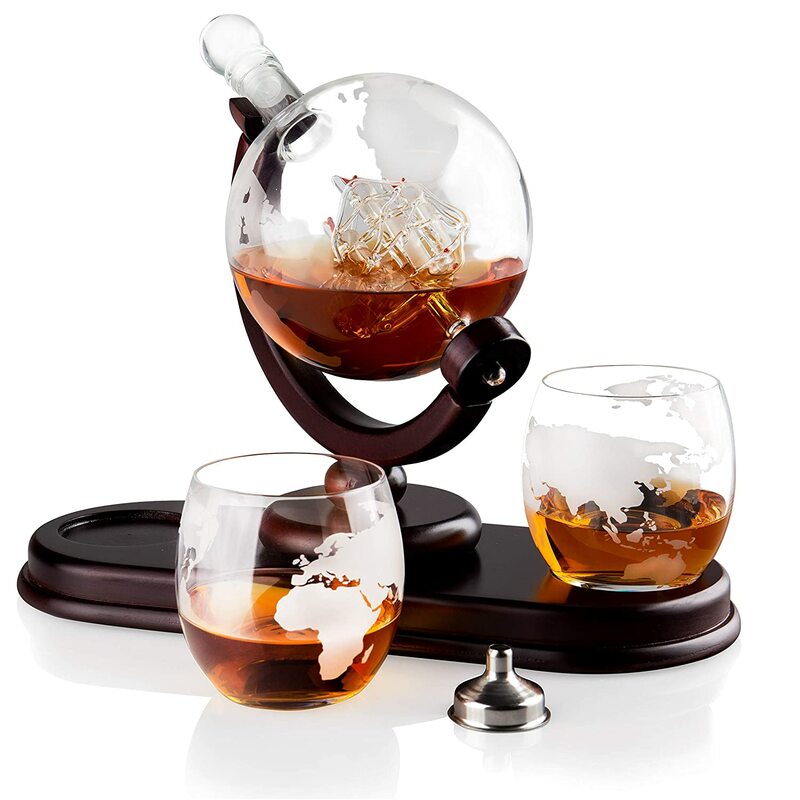 Its unique design will surely captivate any female liquor lover. You can also give this flask as a gift for your friends and loved ones. The 18 oz Stainless Steel Hip Flask Pocket Bottle by Mealivos is a stainless steel flask with a free leather case that you can bring with you anywhere you go. The leather case can carry small cups that you can use to take a shot of your drink. The flask is also easy to clean and hassle-free to carry. You might want to buy this product because it’s lightweight and portable. The flask also has a free funnel so transferring liquor is of no problem. This whiskey flask is the perfect birthday or wedding gift for your friends and family. It’s also easy to clean and dishwasher friendly so there’s no problem with cleaning it. Women can sometimes be secretive especially when it comes to drinking liquor. Hide your hobby of drinking liquor with this fun and handy liquor bracelet. The Women Hidden Liquor Bracelet Flask by Elega is what you need to stay classy while drinking your favorite liquor on the go. This custom design flask is easy to wear and it’s made from FDA approved stainless steel metal. The flask comes with a beautiful box and a funnel for easy transfer. You can now drink your favorite liquor without looking like an alcoholic. The box is slightly thin so don’t expect much of it. The main feature of this product is that nobody will know that your bracelet is actually a flask. You can secretly bring liquor anywhere you want with this flask. Tired of your old silver flask? Why not carry a classy golden flask in your package? The Gold Hip Flask Gift Set by Simpler Life – Great Ideas For Your Life is the flask that you need when you want to show your friends that you’re one classy fellow. The flask has an engraving that says “Well Deserved” which is what you really need. It’s made from high-quality stainless steel metal and it’s coated with gold plating. It’s also 100% leak-free and it can withstand high pressure without spilling. This gold flask is a must buy for those who enjoy drinking while traveling to different places. The gold plating gives off a delicate and elegant vibe to it. The cap is also tightly sealed so you don’t have to worry about spilling it. Tired of bringing a shot glass and a flask whenever you go out? Well, this flask might solve your problem. The Shot Flask – Stainless Steel 8 oz Hip Flask by BarMe is a 2 in 1 flask that guarantees your convenience. The whiskey flask has a built-in collapsible shot glass attached to its body. This unique item is what you need if you’re looking for a flask that comes with a shot glass. The flask also includes a funnel that you can use to refill your liquor. It’s the perfect gift for any occasion and for any event. Cleaning it is not an issue because the flask is dishwasher safe. Do you already own one? What does it look like? Tell us in the comments below!